Buy cheap AtHomeMart 4 PCs Burnt Orange Classic Leather Sofa, Loveseat, Chair, and Ottoman Set (COAS501591-501592-501593-5001594). This fascinating Sofas & Loveseats will suit your rooms. Buy and save your AtHomeMart 4 PCs Burnt Orange Classic Leather Sofa, Loveseat, Chair, and Ottoman Set (COAS501591-501592-501593-5001594) today. 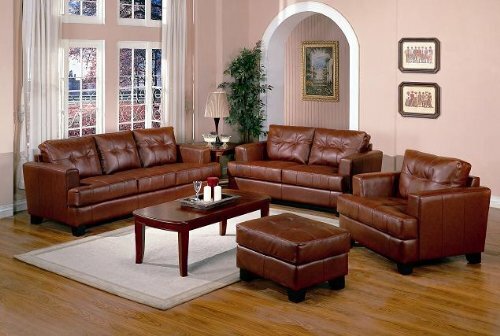 This 4PCs Burnt Orange Classic Leather Sofa and Loveseat Set offers style and comfort with its clean lines and attached seat cushions. This gorgeous sofa features hardwood solid frame, webbed back, sinuous spring base, pocket coil cushion and wood legs. 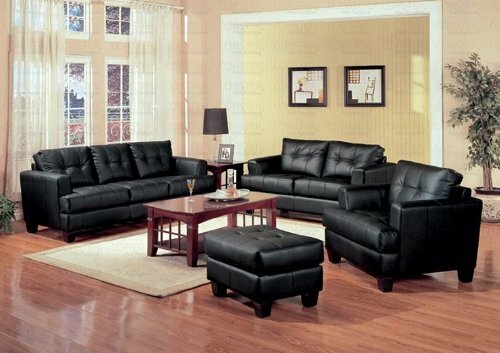 Each piece is covered with 100% Burnt Orange Bonded Leather. The only way to truly appreciate this collection is to sit and experience it. Dimension – Sofa: 86″L x 38″W x 36″H, Loveseat: 67-1/2″L x 38″W x 36″H, Chair: 42″L x 38″W x 36″H, Ottoman: 27″L x 22″W x 19″H. The set includes one sofa, loveseat, chair, and ottoman. This collection is also comes in black and cream color options finish.